Implants anchor natural-looking artificial teeth, keep bone structure intact and are quickly becoming the treatment of choice for some patients who are in need of a single tooth replacement. Many patients are unaware of the bone loss their jaw will incur after the loss of a tooth. This can lead to facial and speech changes over a period of time. 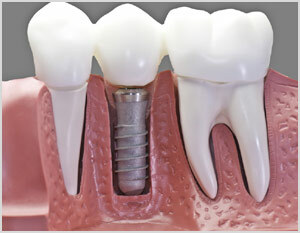 A dental implant allows the bone to grow around the implant holding it in place. This can restore facial and speech changes.